The battle between Qantas and Air New Zealand, is actually one of who's video is the most "cringe worthy" and "inappropriate" (as described by airline staff). You see, the three-minute Qantas demonstration video which is played before take-off on every domestic and long-haul Qantas flight, stars none other than airline ambassador and Hollywood actor, JOHN TRAVOLTA... it has apparently upset some cabin crew and pilots who would rather have a "real pilot" fronting for the company. 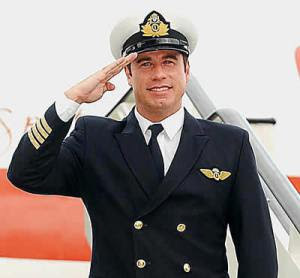 Travolta opens the video with the announcement, "This is your captain speaking - well, maybe not today."... One Qantas flight attendant had described the video as "corny" and "tacky". Let's pause there on these descriptors - CORNY and TACKY!!! This air hostess has obviously not seen the latest inflight safety video from Air New Zealand... after the 'gay outrage' incident that I reported about right here on this blog a few months ago, it seems that the national airline from NZ has opted to show the world that they are NOT homophobic... in fact, they are embracing their sexuality with open arms, by engaging none other than fitness enthusiast, RICHARD SIMMONS!! The three-and-a-half minute video, entitled "Fit to Fly", mashes safety information with an aerobics workout... Along with Simmons, the video has cameo appearances from Phil Keoghan, host of 'The Amazing Race' and Paul Henry, a well known TV host in Kiwi land. Without further delay, dear readers, you decide which one you think is the most 'Corny' and 'Tacky'... and more importantly, which video would make you feel safest when travelling thousands of metres above solid ground? 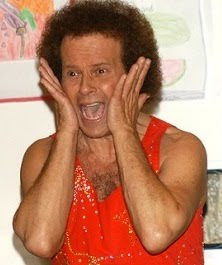 RICHARD SIMMONS and "FIT TO FLY"
JOHN TRAVOLTA and "THIS IS YOUR CAPTAIN SPEAKING"